How you bounce back from adversity has a lot to do with the assets you have in the bank. Your positivity bank. Don’t have one? The University of North Carolina’s Barbara Fredrickson explains why it’s time to start making deposits. Bouncing back: Punching bags are good at it; humans, less so. A growing body of evidence, though, suggests you can ward off tailspins by building up your reserves of the best antidote to adversity: positive emotions, the hidden engine of resilience. "We call it the 'undo effect,'" says Barbara Fredrickson, author of Positivity and a professor of psychology at the University of North Carolina, Chapel Hill, whose research has upended our understanding of a group of emotions that were once considered trifling but are now seen as central to persistence, innovation and success. 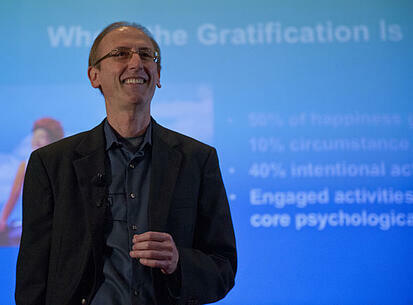 "Positive emotions help speed recovery from negative emotions," Fredrickson says. "When people are able to self-generate a positive emotion or perspective, that enables them to bounce back. It's not just that you bounce back and then you feel good--feeling good drives the process." Negative emotions undermine the brain's capacity to think broadly and find creative solutions. The vise grip of fear and stress and the emotions they generate--anger, blame, panic, resentment, shame--limit thought to a narrow field that obscures options. In a work environment, negativity causes teams to lose flexibility and the ability to be curious. "Losses loom larger than gains," Fredrickson explains. "Our mind is drawn into this mental time travel, and we're obsessing about something negative that happened in the past or we're worrying about what will happen in the future." She has determined that you can reframe adversity and be more effective every day by countering negative loops with a buried resource--the well of joy, hope, amusement, gratitude, interest, appreciation, awe and other buoyant emotions we can call on as needed. These low-key assets have the power to calm blood pressure and operate as a kind of reset button for stress-addled minds and bodies. In one of her studies, test subjects whose anxiety was driven sky-high by an impending public speech were able to reverse negative cardiovascular effects in less than a minute by viewing relaxing imagery. They were shown a tranquil film clip of ocean waves, a puppy playing, a sad film or a neutral screen saver depicting an abstract display of lines. Sensors tracking heart rate, blood pressure and artery constriction showed that those watching the seemingly positive imagery recovered the fastest. Another study, this one based on daily reports of positive and negative emotions, found that the more positive emotions people experienced, the more their resilience levels grew, enabling them to let go of negative events faster. A report Fredrickson co-wrote on bouncing back from business failures ("Beyond hubris: How highly confident entrepreneurs rebound to venture again") suggests that the resources generated by positive emotions can help people overcome setbacks and start new ventures. In fact, the report contends, positive emotions have been shown to help businesspeople negotiate better, improve decision-making, boost creativity and drive high-performance behavior. "Positive emotions expand awareness and attention," Fredrickson says, which is critical for anyone looking for an opportunity or trying to solve a problem. "When you're able to take in more information, the peripheral vision field is expanded. You're able to connect the dots to the bigger picture. Instead of remembering just the most central event, you remember that and the peripheral aspects, too." Working with mathematician Marcial Losada, Fredrickson has discovered a tipping point of positive-to-negative emotions that spells the difference between flourishing and floundering. "It seems like we need at least three positive emotions to open and lift us up to counter every single negative emotion that drags us down," she says. "The good news is that the positive emotions don't need to be intense or profound. They can be rather mild. They just need to be frequent." One of the easiest ways to combat the negative tide is through appreciation or gratitude. Fredrickson advises asking yourself what in your current situation you could be treasuring that you're not. Connecting with someone over a shared interest or amusement is another superb way to shift out of the negative frame. Or step back when you've hit a wall and take a break. Bring some music into your day. The three-to-one ratio isn't something you need to meet every hour or day, but over time, if you're making deposits to your positivity bank, you get a big dividend. "There's really solid evidence that the positive emotions you feel today predict tomorrow's and next week's and next month's success, health and quality relationships," Fredrickson says, "because they build your resources and resilience." Article 1: Any email longer than two paragraphs shall not be sent. Instead, time shall be saved by telephone contact. Article 2: Every person shall practice the 100-Foot Rule, getting up from their posteriors to deliver the message in person to anyone within 100 feet of their desk. Article 3: The overloaded in-boxer shall check messages at designated times to prevent attention deficit. Article 4: There shall be a requirement of determining urgency before response to messaging. Article 5: No book-length thread E-mails, or dispatches as long as "War and Peace" shall be allowed. Article 6: Companies shall establish policies to control e-transmissions as if they were emissions. Article 7: Everyone shall resist the temptation to send one- and two-word responses, such "thanks," "got it." Article 8: There shall be no assumption of unlimited e-access simply because the tools allow it. Message management shall be instituted. Article 9: Permission shall be granted to use auto-responders to block out focus zones for optimum productivity. Article 10: E-contact-free zones/days shall be negotiated to improve performance and jump-start innovation.